The Diving Horses of Atlantic City's Steel Pier jumped 60 down into a special tank. I know this topic has been covered before — Behind the Bit did a posted on this several months ago — but tonight I came across some amazing photos of the diving horses of Atlantic City in the Life Magazine collection on Google. It is such a mind-boggling stunt that I still find it difficult to believe that this was a regular attraction for more than 50 years. I can’t resist adding to the other posts out there. 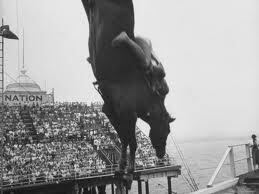 I grew up making regular visits to the Jersey shore, and although I never got to see the horses dive (there were diving horses on Steel Pier from the mid 1920s to 1978! ), they were a legend. The act was created by Dr. W.F. Carver who was riding across a bridge in 1924 when it collapsed, sending him and his horse 40 feet into a river. The horse executed a dive and the two swam safely to shore. He created the act to replicate this feat. 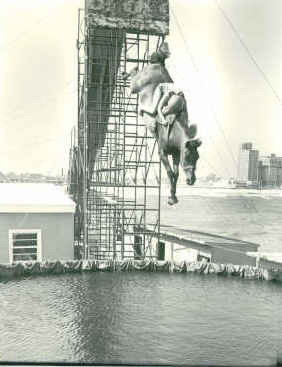 In the Atlantic City shows horse and rider plunged 60 feet into a special tank (eventually the platform was lowered to 40 feet then 35 feet). Sonora Carver, the most famous of the riders (and Dr. Carver’s daughter-in-law) always stated that the horses were not forced to jump under duress. This reminiscence was published by Susan MacDonald in her story, Christmas Essay: The Diving Horses of Atlantic City. Sonora Carver was the most famous rider of the diving horses. She became blind after a dive caused her retinas to detach but continued diving for 11 more years. It is clear that her sister’s loss of sight from detached retinas was due to one bad blow or a number of blows, yet Mrs. French chooses to dwell on the joy of diving. This video, created from a series of still photos, gives you a sense for how long the jumping horses were an attraction. There are some wonderful photos owned by Life Magazine that cannot be embedded but are well worth a look! In this photo, a woman trains a horse to jump by offering it a carrot. I don’t know about your horse, but I don’t think mine would consider a carrot to be enough of an enticement! 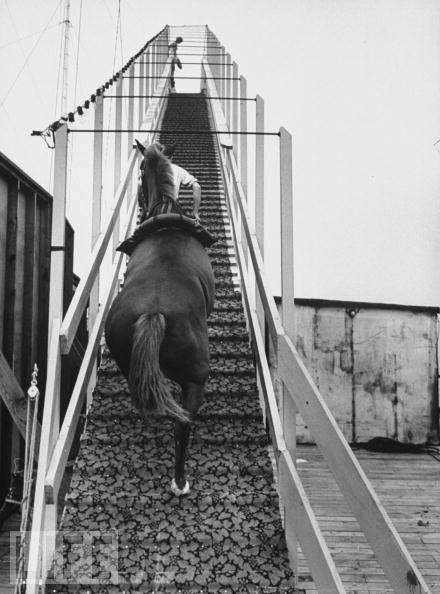 Dimah the Diving Horse climbs the rampDimah, one of the diving horses, climbs the ramp to the diving platform. It strikes me that if a horse didn't want to jump, it would be darn hard to get them up the ramp for five shows a day. Here you get a feel for the steep drop of the jump. This ramp looks a bit lower than the ones at Steel Pier but you wouldn't catch me jumping my horse off! Those readers who want to learn more about the diving horses might enjoy renting the Disney movie Wild Hearts Can’t be Broken. It’s a nice family movie even if Sonora Carver didn’t think it was all that accurate. My girls watched the movie, “Wild Hearts Can’t be Broken” over and over and over again when they were growing up. It was a favorite in our family. It’s perfectly fitting, karmically speaking, that Sonora Carver went blind after suffering injuries caused by her & the promoter’s horrific abuse of horses in providing this entertainment for human animals. As a new & more progressive morality builds & sets, all activities that exploit non-human animals on behalf of human animals will become less & less acceptable & will, eventually, be morally “”proscribed.”. It is truly only a matter of time–if the natural world is not destroyed in the meantime. I just found this article and it makes me smile. My great grandmother was one of the diving girls. I have many pictures, news paper articles and a personal note from Sonora and lorena to my g-grandmother.If anyone is interested I would love to share them. I would love to hear what Sonora said in the note! I am doing a research paper for high school on the diving horses and would love to see some of the inforation you have. Wild hearts can’t be broken has always been my favorite movie since I was a little girl. I am so intrigued by the horses. Kim, That’s so considerate of you. I shared Wild Hearts Can’t Be Broken with my class as part of a class assignment. I’d love to see what your Great Grandmother’s experience was that she shared with you through her photos and news articles. You’re so lucky to have such a legacy. I had a Grandfather who used to swallow swords and fire to raise funds for Church… no photos though just stories passed on, he helped paint it as well. They lived in a different time didn’t they. My email is vvb1955@aol.com that’s v v it looks like a w but it’s not lol. Kim, I would really love to see any information you have on the diving horses. I find the story fascinating! And, the personal connection must make it doubly so for you! Thank you so much! I am interested as I met Marion Lisehora who rode Dinah. She must be in her 80’s and through our short conversation and playing pickleball I found her fascinating and hope to talk more with her soon. Marion gave me a picture of her on Dinah that was on a magazine cover. I would love to clicker train my horse to go into the water so willingly – maybe not dive from so high, but at least leap in or something along those lines, like pre-cross country training. Anyone who is a true equestrian and who has not only ridden but cared for horses and gotten to know many personalities might deduct that these horses DID enjoy their job. They are herd animals just like dogs (and people!) and its within their natural social structure to take on a job and seek a purposeful life – whether that is managing a herd – or diving! I am very involved in promoting ethical treatment to all animals, and I know that it would be very obvious in the animals body language if he did not want to jump. You see this in some young racehorses who don’t want to race and even hunters who repeatedly refuse a jump. If you eat meat whatsoever, don’t even think about saying something negative about horse diving – this alleged “evil” is not even CLOSE to the suffering other animals endure. Focus your energy where it will make a difference and not on some almost-defunct equestrian pasttime. I remember seeing this on the Steel Pier when I was very young. It still stays with me. We then went down in a diving bell about 30 feet down into the ocean. Boy was that a great vacation. I remember this movie when i watched it when i was like 8, i know i was young. But i never saw it again, but i remembered it. But sadly, not the name of the movie, and now thanks to this post, i know it, thank you sooo much!!!! I was so surprise to read that some people would think that the horses were mistreated! The horses were not forced they did what they were thaught to do…just like us humans. Let me tell you about the story of a young girl of 15, who was told to get on the horse as soon as he got near her and hang on tight and keep her head on the side of the horse when he hits the water. She had no idea how dangerous that could be but she wanted to please her caretaker so she did it! Was she unhappy? No, because that is what she had to do? Was she scared? Yes, but that is what she had to do. Was it bad for her? No, because she didn’t know otherwise and didn’t not know the possible consequences. Did it make her life miserable? No, it was nice to be applause and to be granted some benefices because she did what was asked of her. Did some people took advantage of her? Probably, but it was not her perception at the time. The horse and her shared the same reality: they both were not conscious. They did what was expected of them and were gratified for it, what else do you need when you are helpless and not conscious? I know , because I was that girl. I dove at Atlantic Steel Peer so my manager could decide if I were the right girl to do the same show in a pool inside a stadium for Hamid and Morton circus. I was a trapeze artist, but since I was not scared easily , they thought I could make this act also. I did. ..for a year. Two shows after I left, the tank split open when the horse dove, the horse came out of it safe…the girl…..
By the way, Mrs Carver cared a lot about her horses. She was the one who enticed them to jump when I was doing the dives. I dove with Phantom (he was white and very poise; he liked to look around, would not stand any noise or anything thing floting in the water. He could take up to 5 minutes before he decided to jump. And there was Gamel,(he was brown and very quick; he got out of the elevator and went straight on to jump). I would go and talk to them between shows. They did not seem unhappy horses to me, no more different than the horses I’ve seen in different stales since. I am under the impression that a horse do not do what they do not want to do. Mrs Carver told me that it took one hundred horse to find one that would jump in the water. I felt that her horses and the act were her reason to live. The lesson I got from that experience is that what doesn’t kill makes you stronger. That little girl grew up and what bless with a hearth with no fear and that nothing is impossible if we don’t let fear interfer. That is is not what happens to you that makes it good or bad but the perception of it. The horse do not know what is good or bad, it just what is. My aunt Sara Detwiler rode the diving horses in 1955-56. I spoke to her yesterday and she told me due to the fire she doesn’t have a single picture of herself from diving. If anyone has a picture of her I would so greatly appreciate it if you could email it to me so I can forward it to her. Thank you.